1880 $4 Coiled Hair, Judd-1660, Pollock-1860, R.7, PR65 PCGS. 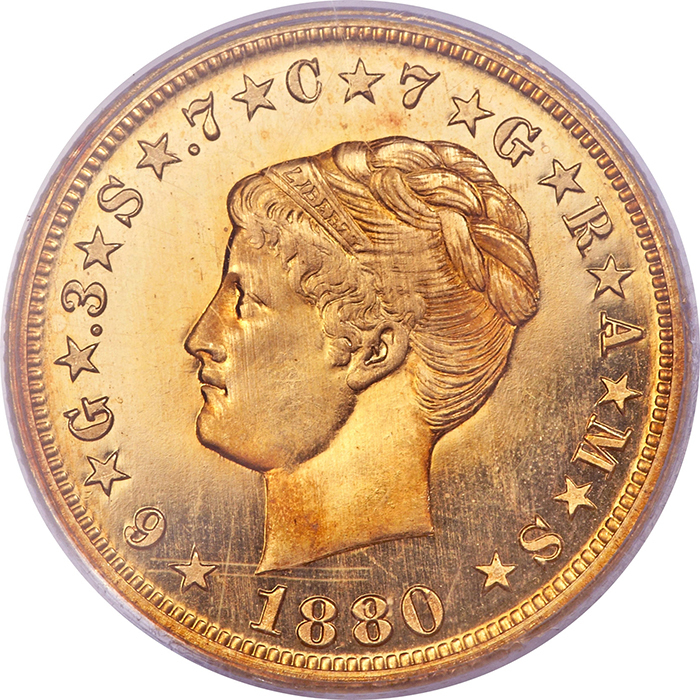 Long Beach, California – Great rarities from Part Two of the New Orleans collection, highlighted by a gem 1880 Coiled Hair Stella, led the way as the Heritage Auctions’ June 4-7, 2015 Long Beach US Coin auction roared to a total of just over $17 million. All results from this official auction of the Long Beach Coin and Collectibles Expo include the 17.5% Buyer’s Premium. Part Two of the New Orleans collection consisted of a mere four coins, but three of them would wind up at the very top of the highlights list for this auction. 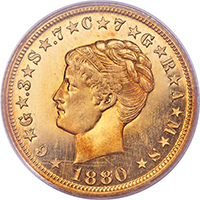 The 1880 Coiled Hair Stella, or four dollar gold piece, is the rarest of the four Stella varieties. This collection featured the Neil-Trompeter example, certified PR65 by PCGS, and when the bidding was over the coin had sold for $1,116,250. A second rare Stella, the 1880 Flowing Hair, sold for $417,125. The New Orleans collection concluded with two rare ten dollar gold eagles. 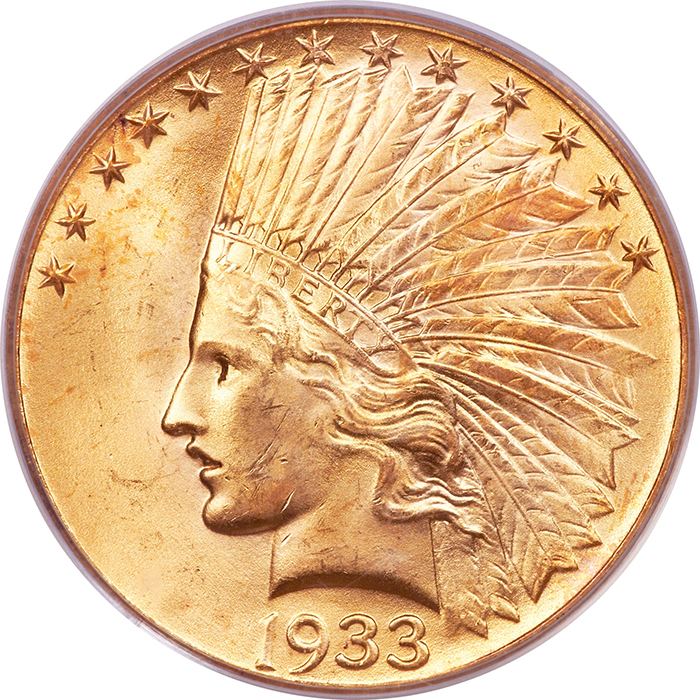 The 1933, a melt rarity from the final year of U.S. circulating gold coin production, was represented by a piece graded MS65 by PCGS (4322), which sold for $587,500. Finally, the BD-1 1798/7 9x4 stars eagle, was represented by the more available of the two 1798 varieties (both overdates). The New Orleans Collection example sold for $199,750 in the Long Beach auction. This auction featured a number of outstanding coins outside of the New Orleans collection. A 1792 Half Disme graded MS64 by PCGS is notable for being the first federal issue struck after the passage of the Mint Act in 1792. 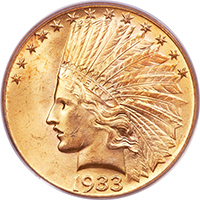 These avidly-collected coins bring high prices in all grades, and this coin did not disappoint, selling for $329,000. A proof 1859 double eagle, defines the concept “fresh to market”, having last been offered in 1962. Only nine examples are available in all grades, and this piece realized $223,250. 1793 1C Wreath, Vine and Bars Edge, S-9, MS65 Brown PCGS Secure: Realized: $176,250. 1822 25C B-1, MS67 PCGS: Realized: $164,500. Kellogg & Humbert 48.03-Ounce Gold Ingot. CAGB-703: Realized: $164,500. 1879 $4 Flowing Hair, Judd-1635, PR64 Cameo Realized: $152,750. 1828 25C B-4, MS67 Realized: $108,687. Visit HA.com/coins to review consignment deadlines and auction dates for Heritage Auctions’ next Signature offering of U.S. coins. Heritage Auctions is the largest auction house founded in the United States and the world’s third largest, with annual sales of more than $900 million, and 900,000+ online bidder members. For more information about Heritage Auctions, and to join and receive access to a complete record of prices realized, with full-color, enlargeable photos of each lot, please visit HA.com.